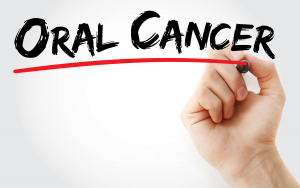 Detecting oral cancer early can nearly double your chance of survival. Therefore, it is important that you know what factors put you at risk of developing the disease and what symptoms to watch for. Approximately 3% of all cancers diagnosed in 2015 involved the mouth or the back of the throat. When certain types of skin cancer were excluded, these oral cancers accounted for most head and neck cancers. spending long periods in the sun, which is associated with lip cancer. Another risk factor on the rise is infection with the human papilloma virus (HPV), which is sexually transmitted. Specifically, HPV is linked to cancers classified as oropharyngeal. Oropharyngeal cancer involves tissues near the back of the mouth and throat, including the back and base of the tongue, and the tonsils. People who have HPV-related oropharyngeal cancer tend to be 4 to 10 years younger than people with oral cancers that are not related to HPV.